HellermannTyton heat-shrinkable moulded shapes blend the advantages of quick, easy installation with high electric strength, mechanical toughness and superior chemical and environmental resistance. These products provide important functional and cost-saving benefits for electronic and electrical applications varying from insulation and protection of individual components to fabrication of complete inter-connecting cable harness assemblies. The shapes are available in a broad range of sizes and options, offering strain-relieving boots, transitions and connector backshell covers as well as other specialised shapes. The company’s extensive product line includes low profile, bulbous and lipped types. 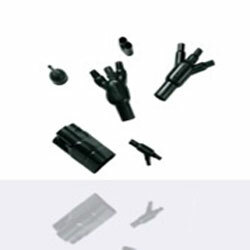 They are suitable for use on circular and D-type connectors as well as complex multiway transitions. Only a minimum number of shapes are required to cover a full range of applications as the products have high shrink ratios, of up to 5:1.